This soft and furry scarf is surely quite a comforter to wear around the house this Winter. It can be worn as a scarf, a shawl and a body wrap for a chilly day. The scarf body is knitted in chevron and feather stitches. It's easy enough for beginners and yet it look so elegance. 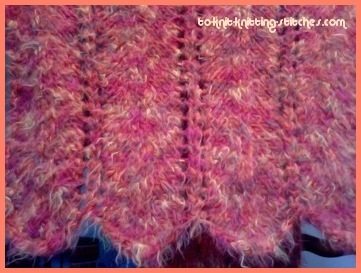 I love the zigzag finished look on both edges of the scarf. This pattern could be great for making a table runner too, I think. When buying yarn for this big chevron scarf, try choosing the yarn in a single color or two but definitely not three. The yarn should be smooth in texture so that the pattern can stand out better. 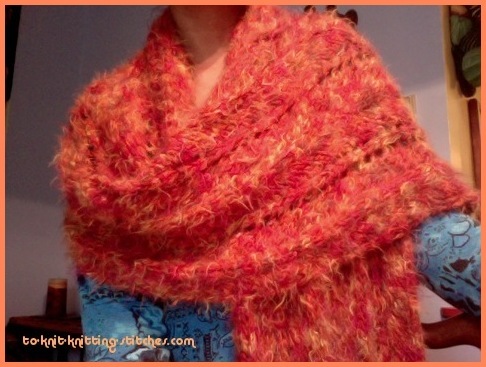 I bought this bulky yarn which I made this scarf a long time ago and I can't even find it now. It's made out of soft acrylic and has furry effect to it. 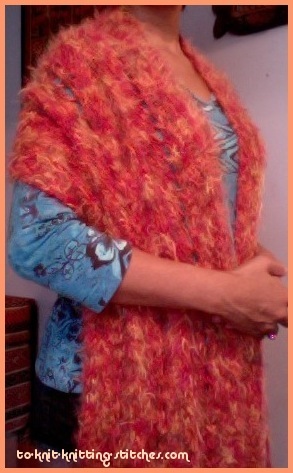 It's so comfy and cozy that I also knitted a vest for my twin girls when they were a year old. Finish Measurement : 15 inches by 77 inches. -4 balls (approximately 400 g / 14 oz) of bulky yarn of your choice. Smooth texture yarn is preferable. -16 inch circular knitting needle US size 13 or needle recommended for your selected yarn. Cast on 53 stitches loosely. Row 1: (right side) *k1, yf, k4, k2tog, sl 1, k1, psso, k4, yf; rep from * to last st, k1. Follow these 2 rows until almost the end of the yarn of your last ball. Bind off all stitches loosely. Weave and trim all excess yarn at each joining points. sl = slip a stitch on to a working needle without knitting it. psso = pass the slip stitch over stitch just knitted (if you're not sure how to do this go to Slip Knit Passover (SKP) for instruction. Yf = bring working yarn forward into the front of work.